This is the true story of Evans's unexpected journey from the pristine halls of Langley to the badlands of southern Afghanistan. Within hours after he watched the horrors of 9/11 unfold during a chance visit to FBI Headquarters, Evans begins a personal and relentless quest to become part of the U.S. response against al-Qa'ida. This memoir tracks his efforts to join one of CIA's elite teams bound for Afghanistan, a journey that eventually takes him to the front lines in Pakistan, first as part of the advanced element of CIA's Echo team supporting Hamid Karzai, and finally as leader of the under-resourced and often overlooked Foxtrot team. Relying on rusty military skills from Evans's days as a Green Beret and brandishing a traded-for rifle, he moves toward Kandahar, one of only a handful of Americans pushing forward across the desert in the company of Pashtun warriors into some of the most dangerous, yet mesmerizingly beautiful, landscape on earth. The ultimate triumph of the CIA and Special Forces teams, when absolutely everything was on the line, is tempered by the US tragedy that catalyzed what is now America's longest war. 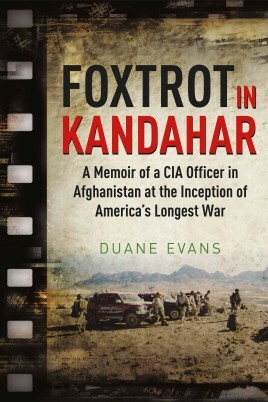 Evans's very personal adventure that unfolds within the pages of Foxtrot in Kandahar: A Memoir of a CIA Officer in Afghanistan at the Inception of America's Longest War, which concludes with an analysis of opportunities lost in the years since his time in Afghanistan, should be required reading for everyone interested in modern warfare. This is essential reading for anyone wanting to get to the bottom of what happened in Afghanistan as the US and their allies fought against the Taliban and al-Qa'ida. The amazing tale of CIA officer Duane Evans as he joins a small force travelling into hostile countryside near Kandahar is riveting, almost like a modern-day tale echoing Kipling's 'The Man Who Would Be King'. Absolutely brilliant. With his experience of Afghanistan in the early days of the fighting and his ongoing involvement until he retired, Evans is able to look at the wider picture and gives his own view of the success or failure of America's involvement. A thoroughly readable personal account with some acute observations of the issues involved. 4 stars.